There are lots of reasons to be skeptical of claims made by Britain's Labour party leader Ed Miliband - recent price increases are far more likely to be due to the actions during years of Labour rule than the recent couple under the coalition; but it is interesting he would single out the regulator for abolishment. "... vowed to abolish energy watchdog Ofgem and replace it with a new regulatory regime that ensures customers get a "fair deal". "We will legislate for this in our first Queen's Speech and it will come into effect in 2017," the Labour leader told activists." "But in the meantime I am not willing to just stand by. So the next Labour government will freeze gas and electricity prices until the start of 2017. "Your bills will be frozen, benefitting millions of families and millions of businesses. That's what I mean by a government that fights for you, that's what I mean when I say: Britain can do better than this. "The companies won't like it because it will cost them money. But they have been overcharging people for too long because of a market that doesn't work. It is time to reset the market." An abstract problem is becoming more real around the world; jurisdictions procuring displacement sources of energy and ensuring them first rights to the grid are struggling to maintain significant capacity of reliable sources to meet demand requirements. Energy companies are to be paid ten of millions of pounds to keep old power stations on standby amid mounting fears of blackouts. They will be paid to mothball, rather than demolish, power stations taken out of service. The plans come as oil and coal plants are being closed due to European Union directives, which have been introduced to cut emissions that scientists have said lead to climate change. The move is being planned after Ofgem, the energy regulator, warned of electricity shortages within the next three years. Ofgem said the measure was needed because new wind farms and nuclear plants have not been built in time to replace the oil and coal power stations being phased out. Critics of wind power said turbines were flawed because they do not generate electricity when there is little wind, while plans for nuclear power stations have yet to reach the construction stage. Engineers: wind and solar "are displacement sources"
In advance of the call for submissions for the Ontario Long Term Energy Plan, Greenpeace/The Pembina Institute issued a new report titled "Renewable is Doable.” The main points in the report are that nuclear investments are costly, inflexible and discourage renewables and conservation, while renewables are flexible and affordable. We at OSPE understand that messages like these capture the public imagination. We all agree, for example, that efforts around conservation and the reduction of greenhouse gases (GHGs) are important. At the same time, engineers understand that there are technical realities that simply don’t support the call to cancel investments in nuclear in favour of bringing more and more renewable online, which will actually serve to increase GHG emissions. Drilling for shale gas through hydraulic fracturing, or fracking, appears to cause smaller leaks of the greenhouse gas methane than the federal government had estimated, and considerably smaller than some critics of shale gas had feared, according to a peer-reviewed study released on Monday. The study’s connection to the petroleum industry — among its sponsors and financiers are Shell, Anadarko Petroleum Corporation, Exxon Mobil and Chevron — may lead some to question its objectivity, some outside experts said. This article is a collaboration between Parker Gallant and myself. It appears on the Energy Probe site, but is reproduced in full here, with a slightly different graphic. The press releases flowing from the Ministry of Energy offices have been many over the past several years claiming a variety of wonderful things despite the mundane attributes of the electricity sector. 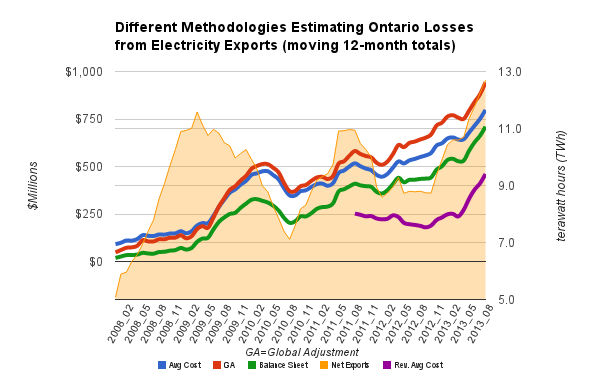 One such release of January 12, 2012 claimed Ontario earned $13 million by exporting our surplus power in December 2011 and that it “keeps costs down” for ratepayers. It also said 20,000 jobs had been created and that the GEA was on track to create 50,000 jobs by the end of 2012. Fast forward a year and a half and a June 20, 2013 press release about the revisedSamsung contract claimed the GEA had created just 31,000 jobs. The latter claim indicates that the target was missed by at least 19,000 jobs. We now know that most of those jobs were short term construction jobs to erect wind turbines and install solar panels. We no longer see press releases that claim we earn money from selling our surplus power to the likes of Michigan and New York perhaps because the Auditor General in his 2011 Annual Report stated that “from 2005 to the end of our audit in 2011, Ontario received $1.8 billion less for its electricity exports than what it actually cost electricity ratepayers of Ontario.” When you examine the Independent Electricity System Operator’s data you quickly learn why the Ministry no longer brags about earning revenue from exports or keeping costs down for ratepayers. The exporting of our surplus power was the subject of a joint article over two years ago but the impact at the time was at a lower dollar level. Background: the EPA has long been on the cusp of introducing regulations for coal-fired power plants, which previous plans delayed for fear they were structured in a way that would make them susceptible to being struck down in court. After the resistance last year, many observers had expected the administration to tone down its rule and possibly create a path for new coal plants using existing technology. But a person who has seen a recent version of the revised rule said it would propose an emissions limit of 1,100 pounds of carbon dioxide per megawatt hour for coal plants and 1,000 pounds per megawatt hour for large gas-fired plants. Last year's version was only slightly different, setting a 1,000-pound limit for both types of plants. Apps to set the scene, introduce conflict, and resolve - for scientists? I encountered too many related stories on the web yesterday not to post something attempting to connect them, including a Dot Earth blog post on storytelling including an app for story building, a Ted Talk including an app for developing Ted Talks, and the article I wrote. ... despite a difference in big numbers, all the methods tell the same tale. Graphics are probably a tool increasingly used to try and move communication away from abstract numbers. Stories, we are told, are another. EU Industry commissioner warns on energy pricing - and natural gas pricing (notably this article includes the impacts note threatened industries that require gas as a feedstock for their product - not necessarily their energy). "We face a systemic industrial massacre," said Antonio Tajani, the European industry commissioner. Mr Tajani warned that Europe's quixotic dash for renewables was pushing electricity costs to untenable levels, leaving Europe struggling to compete as America's shale revolution cuts US natural gas prices by 80pc. "I am in favour of a green agenda, but we can't be religious about this. We need a new energy policy. We have to stop pretending, because we can't sacrifice Europe's industry for climate goals that are not realistic, and are not being enforced worldwide," he told The Daily Telegraphduring the Ambrosetti forum of global policy-makers at Lake Como. "The loss of competitiveness is frightening," said Paulo Savona, head of Italy's Fondo Interbancario. "When people choose whether to invest in Europe or the US, what they think about most is the cost of energy." A report by the American Chemistry Council said shale gas has given the US a "profound and sustained competitive advantage" in chemicals, plastics, and related industries. Consultants IHS also expect US chemical output to double by 2020, while Europe's output will have fallen by a third. IHS said $250bn (£160bn) in extra US manufacturing will be added by shale in the next six years. this is smart: "an incinerator for our hard earned dollars"
Parker Gallant, who I frequently have the good fortune of collaborating with, has a new article inspired by his experience with smart meters. ...power utilities around the world must now be laughing up their sleeve at the wasted money Ontario’s ratepayers are forced to absorb. The “microlab” referenced by the IBM technology consultant has turned out instead to be an incinerator for our hard earned dollars! Parker's writing on smart meters inspired me to take a look at some data for the past couple of years. The data I'm looking at is the the system operator's (IESO), and, to a lesser extent, Hydro One's. Australia's ABC reports, "Kevin Rudd has appeared before his supporters in Brisbane to concede defeat to Tony Abbott and the Coalition." A great day for AGW deniers? Maybe. Only followed the election lightly from afar, but it seemed it was largely a "Seinfeld" election, with the global political handlers union again staying largley unified in ensuring campaigns are no time to talk about ideas. "Greeen" Energy Expense explained: "everything on the ice cream menu"
There are a number of posts on the excellent German Energy blog regarding the energy policies of parties participating in the German election campaign - the parties just aren't providing much substance (basically arguing on ways to cut energy taxes to hide real cost increases for a little while). The political world is wedged between the green-energy lobby, masquerading as saviors of the world, and the established electric utilities, with their dire warnings of chaotic supply problems and job losses. Former Environment Minister Jürgen Tritten of the Green Party once claimed that switching Germany to renewable energy wasn't going to cost citizens more than one scoop of ice cream"
Ontario's Minister of Energy championing the Green Energy Act, George Smitherman, famously claimed, "about 1% per year of additional rate increase associated with the bill’s implementation over the next 15 years." Sounds like a scoop of ice cream, and it sounds like a calculation done as a canned sales pitch instead of one with any validity. "If we don't need to buy this electricity right now or within the next couple of years, it seems the right thing to do for ratepayers is not buy it"
[The Minister] said the province has 130 electricity purchase agreements, and in the 19 cases the companies had not met their contractual obligations. He disputed suggestions the cancellations were a policy shift away from the goals outlined in the Clean Energy Act or support for independent power producers. "If we don't need to buy this electricity right now or within the next couple of years, it seems the right thing to do for ratepayers is not buy it".